Masséna had followed the British back to Lisbon the previous year, until arriving before the Lines of Torres Vedras. He determined against storming this extensive double line of interlocking fortifications. After starving outside Lisbon through a miserable winter, the French withdrew to the Spanish border with the British-Portuguese army following them. Having secured Portugal, Wellington set about re-taking the fortified frontier cities of Almeida, Badajoz and Ciudad Rodrigo. Whilst Wellington besieged Almeida, Masséna reformed his battered army and marched to relieve the French garrison in the city. Wellington chose to check the relief attempt at the small village of Fuentes de Oñoro. Wellington left his line of retreat exposed in order to cover all routes to Almeida: he felt this risk was justified because the French would not have more than a few days supplies whereas he had more than that. The British, Portuguese and Spanish army had 34,000 infantry, 1,850 cavalry, and 48 guns. The French had 42,000 infantry, 4,500 cavalry and 38 guns. Masséna's army was organized into four corps and a cavalry reserve. Louis Loison's VI Corps had three divisions, led by Jean Marchand, Julien Mermet and Claude Ferey. In Jean Andoche Junot's VIII Corps, only Jean Solignac's division was present. Jean-Baptiste Drouet's IX Corps included the divisions of Nicholas Conroux and Claparede. Louis-Pierre Montbrun headed the cavalry reserve. A 1,700-man cavalry force, which included units from the Imperial Guard was also present at the battle under the command of Marshal Jean-Baptiste Bessières. The two divisions of Jean Reynier's II Corps hovered off to the northeast threatening Almeida. Wellington commanded six infantry divisions, Charles Ashworth's independent Portuguese brigade and three cavalry brigades. Brent Spencer commanded the 1st Division, Thomas Picton the 3rd, William Houston the 7th and Robert Craufurd the Light Division. Stapleton Cotton commanded John Slade's and Frederick von Arentschildt's brigades of cavalry. Edward Howorth supervised four British and four Portuguese 6-gun batteries. William Erskine (5th Division), Alexander Campbell (6th Division) and 300 Portuguese cavalry under Count Barbacena were detached, facing the French II Corps. On the 3rd of May, Masséna launched a frontal assault against the British pickets holding the barricaded village, while subjecting the British on the heights east of the village to a heavy artillery bombardment. The village was the centre of the fighting for the whole day, with French soldiers of Ferey's and Marchand's divisions clashing with the British redcoats of the 1st and 3rd Divisions. At first, the French drove the British back under immense pressure, but a charge that included men of the 71st Highland Light Infantry reclaimed the streets and buildings lost earlier in the day. As the sun sank, the French withdrew and the village remained in British hands. The French had lost 650 casualties against only 250 British losses. May 4 saw little combat. Both sides recovered from the ferocity of the previous day of fighting and reconsidered their options and battle plans. A French reconnaissance revealed that Wellington's right flank was weakly held by a unit of partisans near the hamlet of Pozo Bello. Action began again at dawn on the 5th of May. Wellington had left the 7th Division exposed on his right flank. Masséna launched a heavy attack on the weak British flank, led by Montbrun's dragoons and supported by the infantry divisions of Marchand, Mermet and Solignac. Right away, two 7th Division battalions were roughed up by French light cavalry. This compelled Wellington to send reinforcements to save the 7th Division from annihilation. This was only achieved by the efforts of the Light Division and the British and King's German Legion cavalry. Masséna, however, still aimed primarily at securing Fuentes de Oñoro. He sent forward massed columns of infantry from Ferey's division. The village, filled with low stone walls, provided excellent cover for the British line infantry and skirmishers, while the French were severely restricted in the little streets. At first, the French had some success, wiping out two companies of the 79th Highland Regiment and killing the regiment's commander, Lieut-Colonel Philips Cameron. But a counterattack chased Ferey's men out of the town. Drouet launched a second attack on the town. This time it was led by three battalions of converged grenadiers from IX Corps. With their old-fashioned bearskin hats, the grenadiers were mistaken for the Imperial Guard. Again, the British fell back. Drouet threw in about half of the battalions from both Conroux and Claparède's divisions, seizing almost the entire town. In response, Wellington counterattacked with units from the 1st and 3rd Divisions, plus the Portuguese 6th Caçadores. Led by the 88th Connaught Rangers Foot, this effort broke Drouet's attack and the tide began to turn. Low on ammunition, the French had to resort to the bayonet in a futile attempt to drive the British back. One party of 100 grenadiers was trapped in a tight spot and slaughtered to a man. Facing murderous volleys, the French halted and turned, being shot at as they withdrew, leaving their casualties behind. By sunset, French morale had plummeted and many companies were down to 40% strength. 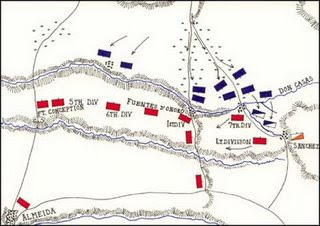 On the threatened British right flank, the elite Light Division, well supported by British cavalry and artillery, made a textbook fighting withdrawal. For trifling casualties, they covered the retreat of the 7th Division and fell back into a stronger position selected by Wellington. During the retreat, whenever French artillery ventured too close, the British cavalry charged or feinted a charge. This allowed the infantry time to retreat out of range. If the French horsemen pressed the outnumbered British cavalry back, the British infantry formed square and their volleys drove off the French. When Montbrun called on the Imperial Guard cavalry for help, Bessières refused to commit his Horse Grenadiers, Lancers and Chasseurs to the attack. This was a classic case of a combined arms force being able to fend off superior numbers of cavalry. Two incidents spoiled this otherwise fine accomplishment. One occurred when a British 14th Light Dragoon squadron pressed home a frontal attack on a French artillery battery and was mauled. In the second case, French cavalry caught some companies of the 3rd Foot Guards in skirmish order and inflicted 100 casualties. The French artillery tried to bombard the new British line into submission, but they were outgunned by Wellington's cannon. Finally, with their artillery ammunition dangerously low, the French attacks came to an end. Wellington's men entrenched during the evening. After spending the next three days parading before the British position, Masséna gave up the attempt and withdrew. 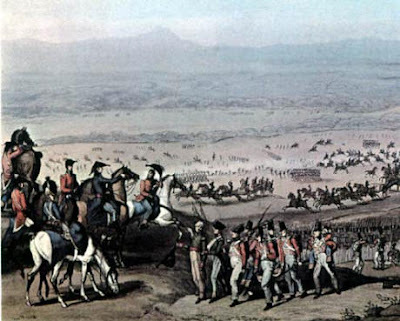 Wellington had repelled the Army of Portugal, inflicted a great number of casualties (the number varies according to different sources from 2,200 to 3,500) for the loss of just 1,500, and was able to continue his blockade of Almeida. Another historian says there were 1,800 British and 2,800 French losses. Wellington however acknowledged how dangerous the situation had been, saying later, "If Boney had been there, we should have been beat." Wellington did not mark the battle as a victory. He considered that he had unnecessarily extended his line too far, putting the 7th and Light Divisions in danger. Two nights after Masséna's withdrawal, General Brennier's 1,400-man French garrison of Almeida slipped through the British lines during the night. About 360 of the French were captured, but the rest got away when their British pursuers ran into a French ambush. This fiasco was blamed on Erskine and others. An infuriated Wellington wrote, "I have never been so much distressed by any military event as by the escape of even a man of them." On reaching Ciudad Rodrigo, Masséna was recalled to Paris by a furious Napoleon to explain his actions (although Napoleon had issued the order to return prior to the battle). He was replaced by Marshal Auguste Marmont. Masséna set off for France with a vast sum of gold, stolen from Portugal and Spain. The defeated French marshal complained that Wellington "had not left him one black hair on his body—he had turned grey all over." Portuguese Brigade: (Brig Gen de Barbacena): 4th and 10th Portuguese Dragoons. [b][url=http://www.uggsbootsoutletmall.co.uk/]uggs boots outlet[/url][/b] In recent times a series of hybrid fountains have appeared and they are proving for being essentially the most rugged, trusted, and economical automatic fountains for the market place. These fountains use the ideal functions of steel and plastic. The casing, frame, and go over are hefty duty, intensely insulated plastic, although the heated trough is built of 304 stainless-steel. [b][url=http://www.cheapuggbootswebsite.com/]cheap uggs[/url][/b] Preference of Wallet with Disposition- Louis Vuitton Multicolor require be fastidiously paired with women, identical to clothing, if that the circumstance, they expose the actual charms. And frequently, purses may disclose that what kind of human being you happen to be, or what sort of event animal you belong to, in case you choose a flawed louis vuitton wholeseller in united kingdom, probably you will come to feel ashamed, as a result of each and every girl pays terrific attentions to her search, moreover to your feeling of semblance for other people. And Louis Vuitton bags are frequently numerous and sleek, people today want to immerse by themselves in the seen pleasure, and the majority of people who such as this model usually are attracted because of the high-class types and generous styles, as well as in addition they provides plenty of alternatives for us, the one of a kind and refined styles display unintentionally the actual charms, quite a few particulars may additionally exhibit the distinctive capabilities. [b][url=http://www.louisvuittonhandbagsu.com/]louis vuitton outlet[/url][/b] Remain serene. It is actually of crucial significance which you don't, under any situations, stress. Panicking will not assist you to in almost any way. The Louis Vuitton identify has approximately net deserving of of $20 billion Louis Vuitton ladies handbag (or purse) is often famed due to monogram design and style and design. The monogram design and type is printed just about everywhere while in the bag. A large number of handbags use a really chequered layout and style. [b][url=http://www.uggsonsalewebsite.co.uk/]uggs on alse[/url][/b] His just leather-based - centered used to is the best readily available. One can possibly identify fairly effortlessly a range of generations. And that is why these are also remarkably rated. The tenor released weakly into Schubert's Die BÃ¼rgschaft, and his small voice was worrisome. He couldn't appear to discover the proper projection, and at the beginning, the accompaniment played out over him. Talking of Deutsch, the man needs to lay off the damper pedal. [b][url=http://www.uggsbootsoutletmall.co.uk/]ugg boots[/url][/b] Folks viewing is an effective technique to entertian yourself for the duration of lay overs at airports. We now have numerous different kinds of people within our region. Some modern immigrants can be noticed donning the garments in their indigenous nations. The amazing thing is the fact anything goes via my mind produces my actuality. As I lessen the range of damaging views running by means of my intellect, my daily life results in being more and more constructive. Instead than fretting above if the glass is 50 percent empty or 50 % entire, I consume the water and fill up the glass once more. [b][url=http://www.louisvuittonbagsukmall.co.uk/]www.louisvuittonbagsukmall.co.uk[/url][/b] Your structural celine handbags 2012 element working with this trunk in celine boston replica comparison in direction of your celine bag UGG 5816 common " booties " i celine outlet commonly dress you in. Many ladies are hunting for these Louis Vuitton Bags mainly because it's fashionable sophisticated designs. In fact, their opponents have wonderful layouts way too. [b][url=http://www.uggsoutletonlinestore.co.uk/]uggs outlet store[/url][/b] Roomy and revolutionary format would offer you by using a cozy journey. Inside the occasion you will be considered one of those people individuals who dislikes obtaining away from your home and would enjoy getting each individual issue front door delivered, probably you suspect that shopping over the internet is usually a risk-free paradise. Chanel N't any 19 Poudre, Eau dom Parfum will probable be new odor then heiress during the long type of Chanel smells..
[b][url=http://www.uggsoutletonlinestore.co.uk/]uggs outlet[/url][/b] This iconic identify, identical to Louis Vuitton, signifies the essence of magnificent items. And this is its origin, after we converse about it today, we will remind of its cultural backgrounds plus the powerful ambiance in tradition and humanities enable it to be brimming with attraction. Louis Vuitton Galliera PM also brings us the cultural shades..
[b][url=http://www.uggsukwebsite.co.uk/]ugg uk[/url][/b] Even so, in trade for their economical support, crowd funders acquire returns, that happen to be finally based on the business people. At present, all the things happens on-line. Thus, no matter whether you an entrepreneur or anyone planning to assist an entrepreneur, the most up-to-date solution to participate in crowd funding should be to decide on a trusted website which has a well-established Crowdfundi ng method. [b][url=http://www.uggsukwebsite.co.uk/]uggs uk sale[/url][/b] The perfect Fine artwork Of Go Louis Vuitton component is you do not even really need to devote only one cent just for this. They are planning to invite you in together with a teeth and allow it to be genuinely rapid. But virtually nothing could probably be realized accurately, individuals that should get an activity is hardly ever again louis vuitton belts.